Synthetic peptide within Human Histone H3 aa 1-100 (tri methyl K27). The exact sequence is proprietary. WB: HeLa and NIH/3T3 whole cell lysates. IHC-P: Human colon, mouse colon and rat kidney tissues. ICC/IF: HeLa cells. ChIP: Chromatin prepared from HeLa cells. ELISA: Histone H3 – unmodified, Histone H3 - mono methyl K4, Histone H3 - di methyl K4, Histone H3 - tri methyl K4, Histone H3 - mono methyl K9, Histone H3 - di methyl K9, Histone H3 - tri methyl K9, Histone H3 - mono methyl K27, Histone H3 - di methyl K27 and Histone H3 - tri methyl K27 peptides. Our Abpromise guarantee covers the use of ab192985 in the following tested applications. We suggest to use 2% BSA as blocking and antibody dilution buffer. To get stronger band, 1%SDS Hot lysis method is also recommended. PepArr Use a concentration of 0.1 µg/ml. 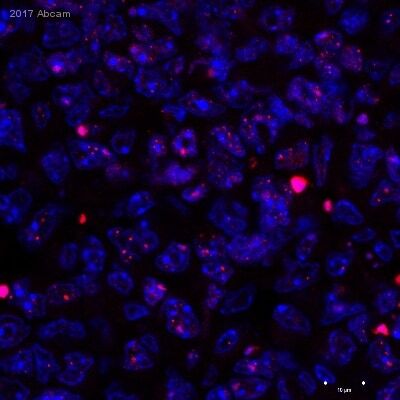 Chromatin was prepared from HeLa (Human epithelial cell line from cervix adenocarcinoma) cells according to the Abcam X-ChIP protocol. Cells were fixed with formaldehyde for 10 minutes. The ChIP was performed with 25 µg of chromatin, 2 µg of ab192985 (blue), and 20 µl of Anti rabbit IgG sepharose beads. 2 μg of rabbit normal IgG was added to the beads control (yellow). The immunoprecipitated DNA was quantified by real time PCR (Sybr green approach). For this product, we recommend 1% SDS hot lysis method. Immunofluorescent analysis of 4% paraformaldehyde-fixed, 0.1% Triton X-100 permeabilized HeLa (Human epithelial cells from cervix adenocarcinoma) cells labeling Histone H3 (tri methyl K27) with ab192985 at 1/1000 dilution, followed by Goat Anti-Rabbit IgG (Alexa Fluor® 488) (ab150077) secondary antibody at 1/1000 dilution (green). Confocal image showing nuclear staining on HeLa cell line. The nuclear counterstain is DAPI (blue). Tubulin is detected with Anti-alpha Tubulin mouse MAb (ab7291) at 1/1000 dilution, followed by Goat Anti-Mouse IgG H&L (Alexa Fluor® 594) (ab150120) secondary antibody at 1/1000 dilution (red). -ve control 1: ab192985 at 1/1000 dilution, followed by Goat Anti-Mouse IgG H&L (Alexa Fluor® 594) (ab150120) secondary antibody at 1/1000 dilution. -ve control 2: Anti-alpha Tubulin mouse MAb (ab7291) at 1/1000 dilution, followed by Goat Anti-Rabbit IgG H&L (Alexa Fluor® 488) (ab150077) secondary antibody at 1/1000 dilution. Immunohistochemical analysis of paraffin-embedded human colon tissue labeling Histone H3 (tri methyl K27) with ab192985 at 1/500 dilution, followed by Goat Anti-Rabbit IgG H&L (HRP) (ab97051) at 1/500 dilution. 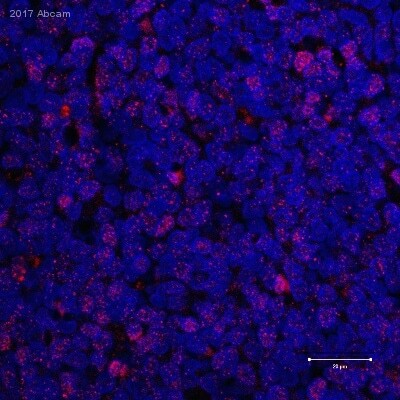 Nuclear staining on human colon tissue is observed. Counter stained with hematoxylin. We recommend to use 2% BSA as blocking and antibody dilution buffer. The antibody is blocked by tri methyl K27 peptide (lane 10) and slightly by di methyl K27 peptide (lane 9, there is 14% cross reactivity with di methyl K27 as determined by ELISA). 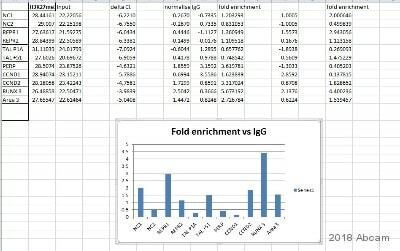 Peptide array analysis was performed using ab192985 at a concentration of 0.1 µg/ml, followed by Goat Anti-Rabbit IgG, (H+L), Fluo 647nm conjugated secondary antibody at a 1/50,000 dilution. ab192985 was tested in Peptide Array against 501 different modified and unmodified histone peptides; each peptide is printed on the array at six concentrations (each in triplicate). ELISA analysis was performed on 1 µg/ml of antigen using ab192985 at a concentration range of 0-0.25 µg/ml, followed by Alkaline Phosphatase-conjugates AffiniPure Goat anti-rabbit IgG (H&L) secondary antibody at a 1/2,500 dilution. All batches of ab192985 are tested in ELISA against peptides to different Histone H3 modifications. Results show strong binding to Histone H3 - tri methyl K27 immunizing peptide, indicating that this antibody specifically recognizes the Histone H3 - tri methyl K27 modification. Weak binding (14%) was also detected against H3 - di methyl K27 modification. 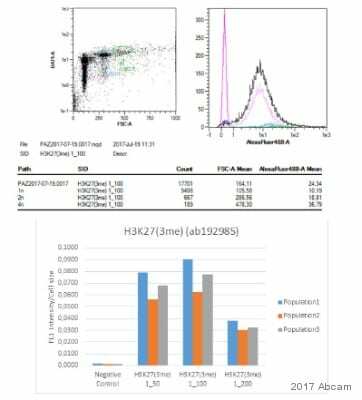 Immunohistochemical analysis of paraffin-embedded mouse colon tissue labeling Histone H3 (tri methyl K27) with ab192985 at 1/500 dilution, followed by Goat Anti-Rabbit IgG H&L (HRP) (ab97051) at 1/500 dilution. 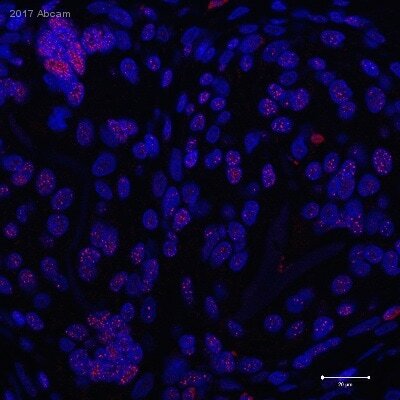 Nuclear staining on mouse colon tissue is observed. Counterstained with hematoxylin. Immunohistochemical analysis of paraffin-embedded rat kidney tissue labeling Histone H3 (tri methyl K27) with ab192985 at 1/500 dilution, followed by Goat Anti-Rabbit IgG H&L (HRP) (ab97051) at 1/500 dilution. 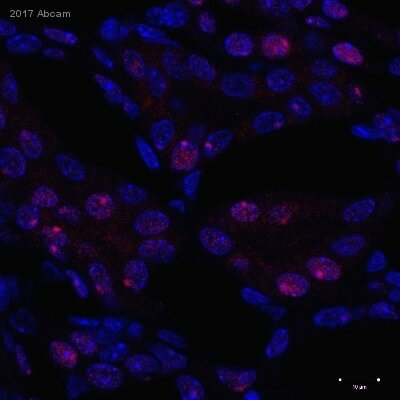 Nuclear staining on rat kidney tissue is observed. Counterstained with hematoxylin. Publishing research using ab192985? Please let us know so that we can cite the reference in this datasheet.